Update - The India-spec Husqvarna Vitpilen 401 has been spied testing on a video by YouTuber 'K9IGHT RIDER INDIA'. According to the YouTuber, the test mule had a minor accident, which resulted in a broken right-side mirror and scratches on the exhaust. The India-spec Husqvarna Vitpilen 401 cafe racer has been spied testing once again in India. Unlike the global model, which comes equipped with wire-spoke wheels, the India-spec Husqvarna Vitpilen features orange alloy wheels from the KTM 390 Duke. Furthermore, the test mule is also equipped with a rear grab rail. The Vitpilen 401 is a modern cafe racer that adopts a radical design philosophy. According to a report dated 26 December, the launch of the Vitpilen 401 has been delayed to 2020. A report from November 2018 suggested that the Husqvarna 401 twins will initially be imported in India. The Husqvarna Vitpilen 401 is underpinned by a steel trellis chassis and a slightly modified rear sub-frame that is borrowed from the 390 Duke. The motorcycle features a round LED headlamp with a fully-digital instrument console on top of it. The cafe racer aesthetics are highlighted by low-set clip-on handlebars and rear-set footpegs. The aggressive ergonomics lends a sporty character to the cafe racer. 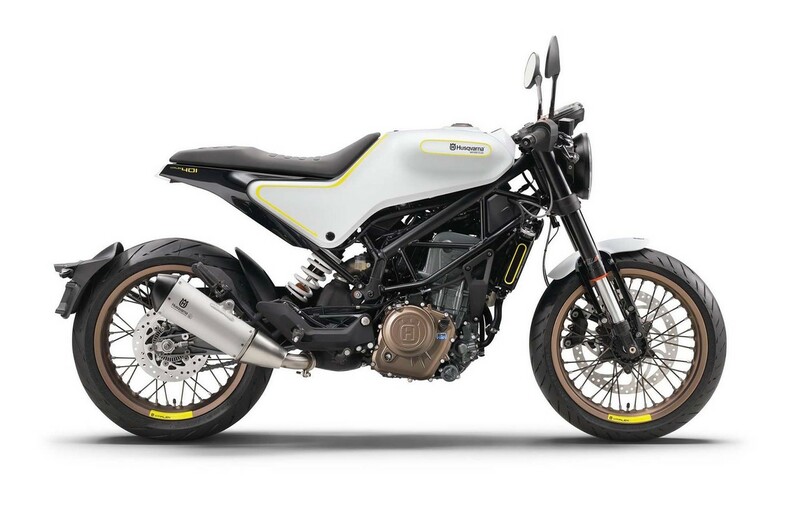 Powering the Husqvarna Vitpilen 401 is a 373.2cc, DOHC, 4-valve, liquid-cooled motor with fuel injection that is mated to a 6-speed gearbox, along with a standard PASC slipper clutch. The engine develops 44 PS of maximum power and 37 Nm of peak torque. Rider aids include a ride-by-wire throttle system, which should offer a linear power delivery. Husqvarna Vitpilen 401 cafe racer features an aggressive riding posture, with clip-on handlebars and rear-set footpegs. Braking performance is handled by disc brakes at both the ends with radially mounted callipers and sintered brake pads. Suspension duties are handled by open-cartridge dual function WP USD forks up front and a preload adjustable rear WP mono-shock. The Husqvarna Vitpilen 401 will be positioned as a premium offering as compared to its KTM counterparts. We expect the motorcycle to be priced around INR 2.60 lakh (ex-showroom).